The Honorable Prime Minister – ‘Akilisi Pohiva launched the Excellence Logo and slogan to mark the celebrations of Public Service Day, in a special program at the Tanoa Hotel yesterday. Public Service Day is celebrated nationwide today, with thousands of public servants and staff of public enterprises gathering at the Queen Salote Memorial Hall with displays from each ministry to highlight the day. This is the first celebration of Public Service here in Tonga which was initiated by the Public Service Commission – PSC. 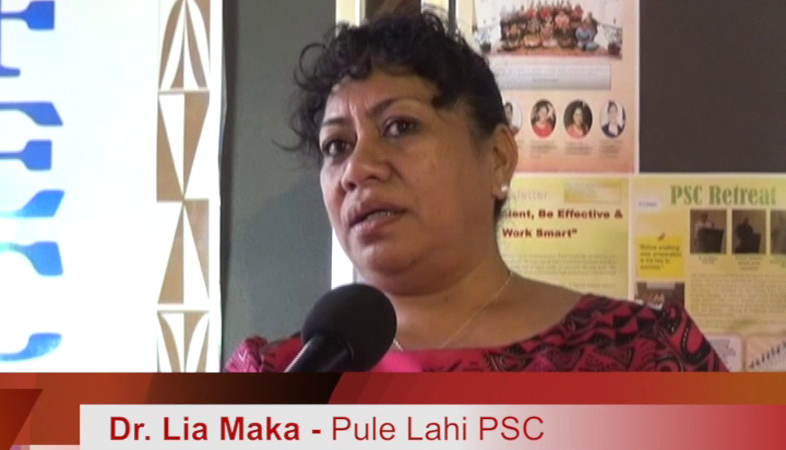 The CEO of PSC – Dr Lia Maka says public service is important to the entire nation as the standard of public service reflect the standard of excellence in the country. Maka adds, it is a vision of the government for the people to attain a higher standard of living and the way to achieving this begins with the service of the government officials – the public servants of the country. The theme of the celebrations – “Excellence – our only option” further emphasises this vision for improving public service. The CEO of the Ministry of Tourism, ‘Emeline Tuita, says this slogan and the logo underpin the goal that public servants should strive to achieve. It was a vibrant occasion at the Queen Salote Memorial Hall today with many public servants setting up display booths showcasing each ministry and several public enterprises functions in serving the people. Public Service is celebrated throughout the month of June and the Public Service Commission hope that the important message they are promoting will continue to be heeded throughout the rest of the year.